← CEO pay. Would you take this job for $12 million a year? Another Retail Format Becoming Extinct? 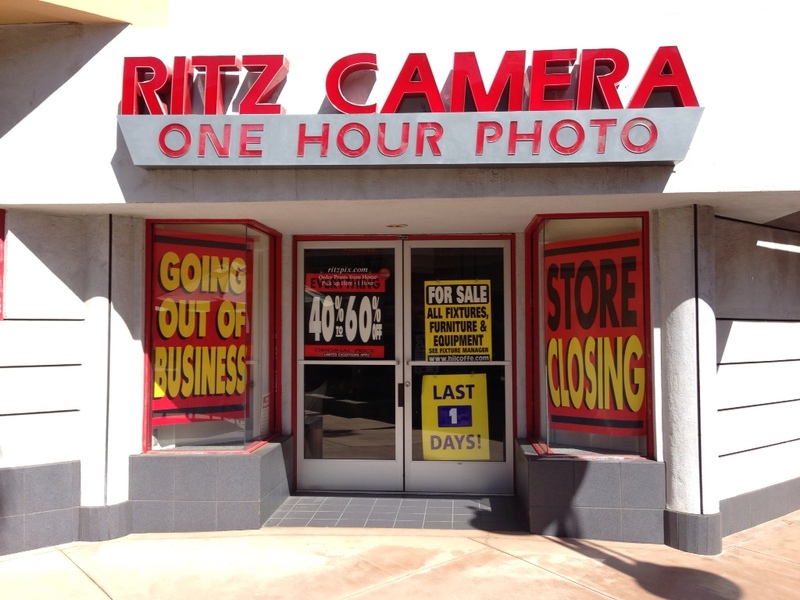 Ritz Camera, the largest specialty camera shop in the U.S. is closing its doors. Along with its sister company Wolf Camera, the chain is shuttering all 137 locations, leaving the U.S. without a national brick and mortar camera chain. Ritz has been struggling for years and a previous bankruptcy action was not able to solve their problems. Camera buyers will now need to purchase cameras through the few remaining independent neighborhood camera stores, general merchandise chains such as Costco, and Best Buy, or online through Amazon.com, and camera specialty outlets like B&H Photo. Clearly, Ritz was hurt by a major shift in the camera industry, and couldn't adjust from a market that not only deserted film, but also quit printing pictures in favor of sharing images electronically. Ritz tried unsuccessfully to shift from photo processing and printing to more emphasis on cameras. The camera business is undergoing its own transformation. Mass market point and shoot camera sales have been hurt by camera-equipped smartphones. The better camera industry might now become divided into DSLR cameras for photo enthusiasts and cameras for professionals. While industry sales are projected to grow, it remains to be seen how the retail market will be segmented. It's entirely possible that the Digital SLR category will become dominated by online merchants. Are there any lessons here for brick and mortar retailers in other product areas? This entry was posted in Business and tagged business, camera, photography, photos. Bookmark the permalink.